HOUSTON (Reuters) - A Carlyle Group $1 billion deepwater crude export project faces a delay of up to 18 months after regulators called for a full environmental review, officials said, a setback in the private equity firm's race to be first to open a new deepwater, U.S. Gulf Coast export hub. Carlyle and commodities trader Trafigura AG are vying to open the first Texas port in Corpus Christi that can fully load supertankers. Carlyle has partnered with the port for a dredging project that would enable it to fully load supertankers capable of carrying 2 million barrels of oil to destinations worldwide. Trafigura has proposed an offshore port, which requires no dredging and a less extensive permitting process. The U.S. shale boom has prompted a surge in oil exports, upending global supply and sparking a race to build infrastructure that can handle those vessels. Exports recently hit a record 3.6 million barrels a day and should keep rising. The U.S. Energy Department has projected that domestic output will exceed 13 million bpd by 2020. Currently, U.S. export capabilities are constrained because the U.S. Gulf, which handles most oil exports, only has one port, located in Louisiana, deep enough to fully load those vessels without resorting to expensive ship-to-ship transfers in deeper waters. The U.S. Army Corps of Engineers, which issues permits for dredging projects, has recommended a full environmental impact statement (EIS) for Carlyle's project to dredge the ship channel to a depth of 75 feet, Port of Corpus Christi Authority Chief Executive Sean Strawbridge said in an interview on the sidelines of the CERAWeek energy conference in Houston. "They took the position that it's better to do an EIS," Strawbridge said referring to the lengthier, full review. "We know with 100 percent certainty it's not going to take longer than 24 months." The Carlyle group had sought to complete a shorter review, called an environmental assessment, which can take as little as a few months, citing the dredging project's similarity to an earlier proposal that had undergone a full review. The full review could push back by 18 months until early 2022 Carlyle's plan to expand a pathway for fully loaded supertankers, Strawbridge said. The facility will begin partially loading those vessels late next year, using smaller tankers to complete loading at sea, a process called reverse lightering used at several locations along the U.S. Gulf. Mark Williford, a spokesman for the Army Corps, would not confirm whether it had recommended a full EIS for the project. Carlyle remains committed to the project, expects to begin partially loading tankers on its original 2020 schedule and will be able to fully load by the third quarter of 2021, said Ferris Hussein, a Carlyle managing director. It still hopes to convince regulators to streamline the environmental review and believes the dredging needed could be completed in six to eight months after permits are received. Carlyle faces contract penalties if it is unable to fully load supertankers at its dock by late 2021. "The EIS hasn't changed our development plans. We have had internal discussions about 'do we want to amend our agreements with shippers?' and we said 'no, we can make it,'" said Hussein. "Everything is still on time." Trafigura has proposed a deep water port 13 miles off the Texas coast. Offshore projects face different regulations and a shorter review process. It has said its export port could be operating by mid-2021. 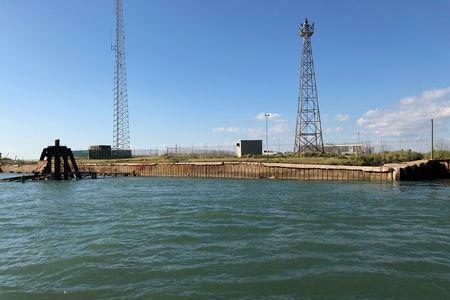 The Port of Corpus Christi Authority, Carlyle's partner, is proposing to dredge its ship channel to a depth of 75 feet from 47 feet now. That would allow the loading of supertankers carrying up to 2 million barrels of oil to Asia, Latin America and Europe from a dock on a harbor island. Corpus Christi's port shipped about 710,000 bpd in December, according to public data. Strawbridge said the partners hope to shorten the onshore project's 24-month review by at least six months by appealing to the Federal Permitting Improvement Steering Council, a Trump administration effort to speed regulatory decisions on infrastructure. Alex Herrgott, executive director of the steering council, declined to comment, a spokeswoman for the council said. Valley National (VLY) Earnings Expected to Grow: Should You Buy?